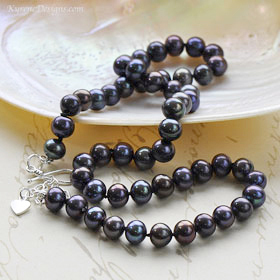 Lustrous high-grade 'peacock' black cultured pearls; this elegant heirloom quality necklace drapes beautifully as I've hand knotted each pearl with matching pure silk, protected at the clasp by french wire - the standard in good pearl jewellery. Made to Order. 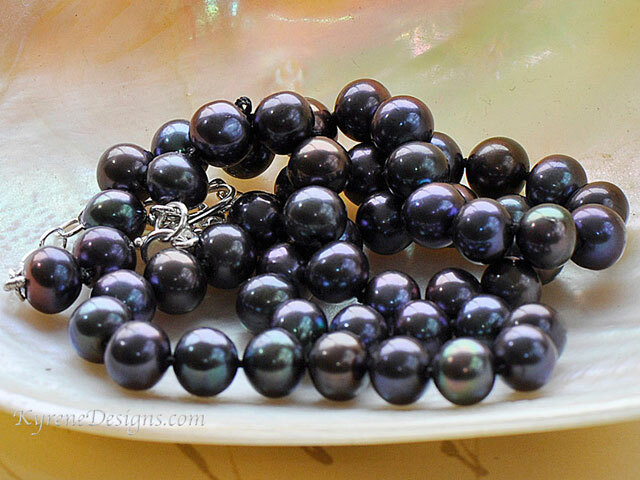 Gorgeous deep berry colours, permanently dyed dark blues, plums, greens. A jewellery collection essential. Different from pearl necklaces in shops - has 'easy to use' sterling silver hook clasp, plus 2" extender for flexible fit. Length: 17 inches. Pearl 7-8mm. Options: contact sales@kyrenedesigns.com for bespoke length, different clasp, matching set, or a 14ct gold fill version.